Rubber/plastic stopper #4 suitable for salt and pepper shakers. 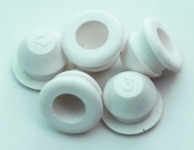 Plug diameter 14.5mm. Sold as a single.